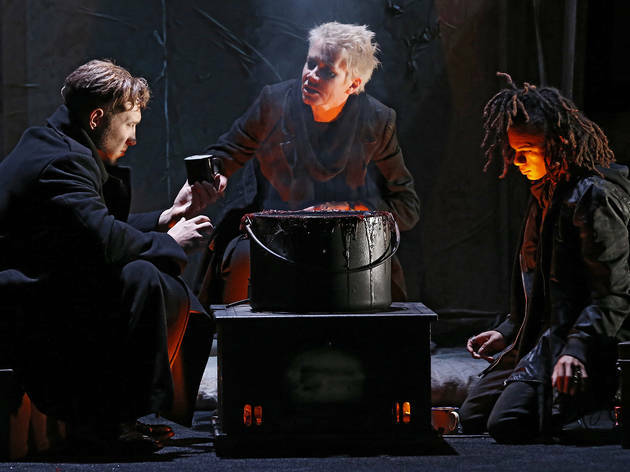 Macbeth is the shortest of Shakespeare’s tragedies by far, which gives the play a kind of horrific momentum, always pushing from behind so that the audience gets a sense of the characters being elbowed unwittingly toward a precipice. Just who or what is doing the elbowing is a question the dramatist leaves unanswered, but it’s also a question every director of the play needs to address. Who are the “weird sisters” and what do they want to do to the world? Director Simon Phillips – who’s been on the Macbeth merry-go-round before for MTC, back in 1989 – envisages these agents of darkness as modern-day terrorists, nonchalantly exploding a bus shelter in the opening scene, before moving on to radicalise their perfect suicide bomber in Macbeth (Jai Courtney). A soldier who has proven himself on the field of battle by fighting a man “till he unseamed him from the nave to th’chops”, Macbeth is predisposed to violence and mayhem. It’s fine while he’s doing it in service to the state, but when he turns that destruction inward, in service to his black and deep desires, chaos naturally reigns. There’s never really been a definitive portrayal of Macbeth, possibly because the twin skills the role requires are rarely seen in the one actor. The character needs pure brawn to be convincing as a killing machine, but his soliloquies cry out for the poetic frenzy of a Dante. Courtney holds his own very ably in the former mode, but seems hopelessly at sea in the latter. There is a kind of grounded heft to his performance, but that’s only occasionally helpful; the rest of the time, when Macbeth’s imagination soars and stoops towards its prey, it feels like gold flakes passing through wet sand. This is most evident in the early scenes, precisely when the play is at its most gripping. 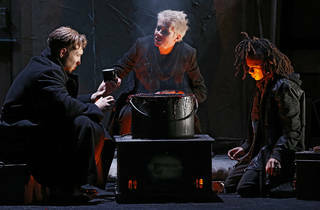 Macbeth’s profound ambivalence, his “equivocation” over the murder of Duncan (Robert Menzies), is supposed to be a key point of connection for the audience. If we don’t feel his existential terror at this unnatural usurpation, we can’t follow him later in his “strange and self-abuse”. Courtney is oddly disassociated in the opening scenes, and it is left to Banquo (Kevin Hofbauer, in what is one of the finest performances of the night) to suggest the moral quicksand into which the two soldiers are wading. 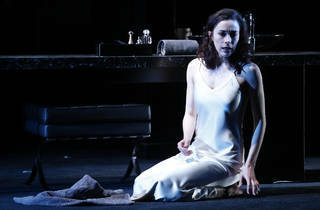 Geraldine Hakewill fares better as Macbeth’s “fiend-like queen”. From the beginning she manages to convey a brittle fragility, a deep vein of humanity, under the icy exterior she wears as her mask to the world. 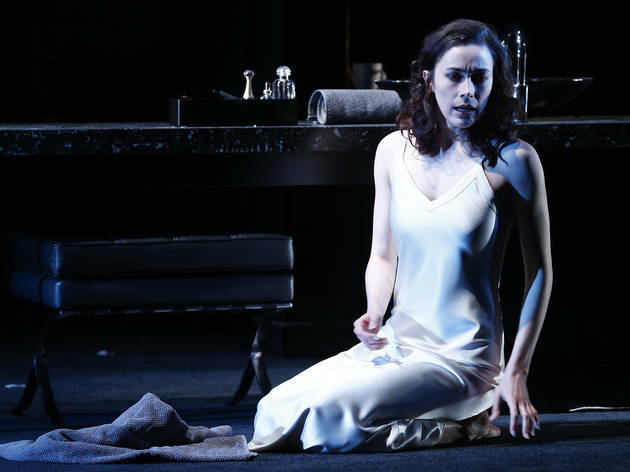 Her Lady Macbeth is as much a cleaning woman as a muse for devilish acts, left to tidy up and make nice when the madness takes hold. As a couple – most notably in their scene of preparations for the banquet – there’s a bone-deep weariness at play, a sense that the lifeblood has been hacked and drained even before the retribution comes. But the lead-up to the murder is oddly muted; we get no sense of the monumental rift such an act represents. Other actors who make an impression are Dan Spielman’s deeply sympathetic Macduff, Shareena Clanton’s poignant Lady Macduff and Jane Montgomery Griffiths’ formidable First Witch, who alone carries the play’s “supernatural soliciting”. Menzies is strangely stiff and colourless as the doomed king, but then so much of his part is cut that it’s impossible to convey the depth of compassion and wisdom of which the character is capable. The cuts throughout are bizarre; the opening scenes are so truncated that we learn nothing of the skirmish that opens the play, but then an obscure scene between Malcolm and Macduff is played in its entirety. Worse, Phillips changes words he thinks audiences will misunderstand – he has Macbeth say “The greatest is beyond” when the line is “The greatest is behind” – and worst of all, adds the word “side” to Macbeth’s line about vaulting ambition. This throws out the pentameter, forces an interpretation very much under dispute, and doesn’t add anything to the audience’s comprehension. Technically, the play is something of an assault on the senses. 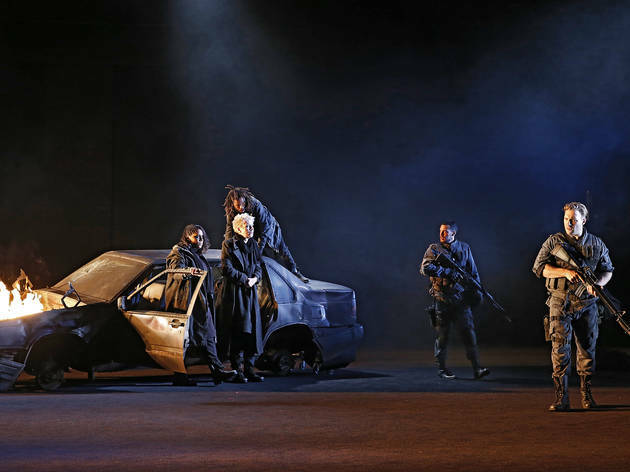 Shaun Gurton’s set is a black, unholy maelstrom of burning cars, sleek granite surfaces and fascistic equestrian imagery which slowly introduces the browns and taupes of rebellion as Malcolm (Tom Hobbs) and Macduff plan their resistance. Gurton often heaps furniture on one side of the revolve, leaving a vast plain of nothing on the other half, recalling William Hazlitt’s comment that the play “moves upon the verge of an abyss”. Esther Marie Hayes’ costumes are superb, especially the various iterations of military dress that effortlessly denote status and rank. Ian McDonald’s score, however, is ludicrously bloated and insistent, as emotionally manipulative as a Hollywood action film. It’s another example, along with the textual manipulations, of a production that doesn’t trust the play to work its own effects. Phillips is a self-confessed showman, a director of broad strokes and arresting mise-en-scène, which can work for Shakespeare – his 2010 Richard III was sublime – but can also come across as belligerent and compensatory. 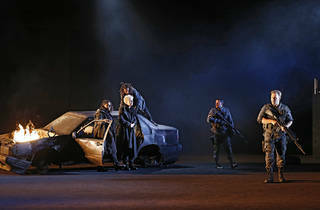 His concept here, of a burnt-out, ravished wasteland in which a madman can rise to tyranny, is muscular and resonant, but it also leaves little room for the intellectual horrors that are the real driving forces of this brutal play. MTC have added four performances of Macbeth to their original season: Jul 16, 17, 18 and 19.